The market is poised to continue higher as the Fear Of Missing Out rally pushes stocks higher. Everyone appears so convinced that the tax cuts will boost earnings another 7% to 12% they have pushed stocks in 2018 to the best start since 2003. The S&P futures are up +6.50 as I type this so Tuesday's open is looking positive again. There is not a lot to say about the current rally. It has exceeded expectations. It has reached irrational exuberance levels. It is eventually going to end badly. The recent gains are off the scale when looking at individual stocks as well as indexes. Because everyone is focused on the guidance that will be given with Q4 earnings, the bullishness could continue for another four weeks. Personally, I believe that once most of the S&P companies have reported, we are going to see some significant weakness because everyone will assume all the good news is priced into the market. While that may be true to some extent, the Q1 earnings will be just as important. Only a few of the 26 S&P companies that have already reported have mentioned tax benefits or impacts. Up until now it has been too soon for the accountants to be comfortable with everything in the 500 page reform bill. We will begin to see some more guidance in the weeks ahead but the real fireworks could come in the Q1 earnings cycle. This is where the actual post reform earnings will be reported. This is where most of the dividend increases and stock buybacks will be announced. For me, that means any post Q4 earnings letdown could be brief, as in several weeks, but more importantly it will be a buying opportunity for the Q1 cycle. Unfortunately, after the Q1 cycle, somewhere around the May option expirations, we could see a bigger decline. The summer doldrums could be especially painful in 2018. The markets have rallied too far, too fast and a lot of that profit will need to be captured. Those thoughts today and $5 will get you a cup of coffee at Starbucks but they are not a guarantee of future performance. Nobody knows what the market will do at any time. Everything is a calculated guess from my 35 years of investing and my 20+ years of market analysis for Option Investor. We will try to navigate the road ahead as it appears in front of us. Picture a narrow dirt road in a mountain forest with twists, dips and hills. We will navigate it as each pothole becomes visible. The first pothole is going to be the potential government shutdown on Friday. The two sides appear to be moving farther apart rather than closer to a compromise. Watching the news programs this week, most analysts believe either it will be a shutdown or they will agree to kick the can down the road with a new February deadline. The can kick will be mildly positive for the market where a shutdown would likely cause a short-term dip. If we do get a shutdown, it would be a buying opportunity. 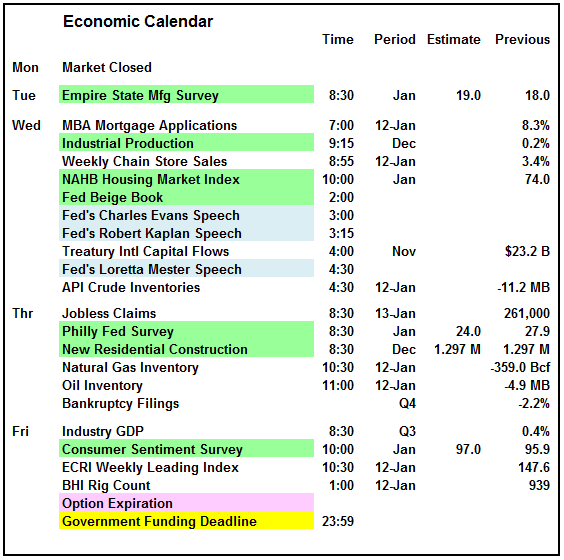 There is nothing on the calendar for next week that will move the market other than the potential shutdown. 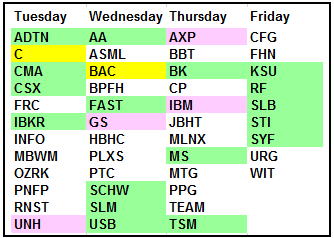 Everyone is going to be focused on the first full week of earnings. There are 27 S&P companies reporting, which included four Dow components. Goldman Sachs and United Health are likely to cause the most Dow volatility. There are numerous financials besides Citi and Bank of America but they will set the stage for the sector on Tue/Wed. 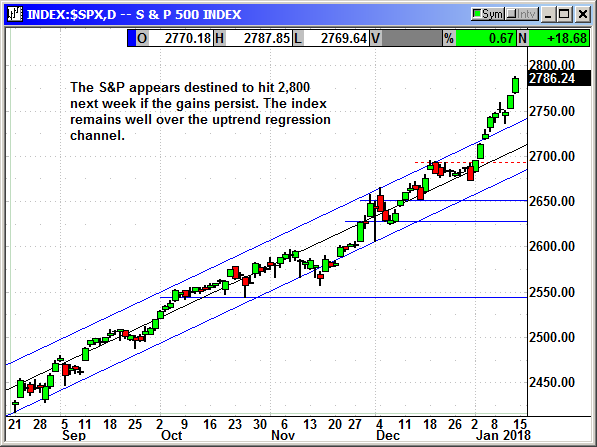 The S&P is likely to hit 2,800 this week and Goldman's target for the year is 2,850. We are nearing nosebleed levels but investors do not seem to care. Support is in the 2,750 range if we were to see any market weakness. The Dow is moving closer to 26,000 and a touch this week would be the fastest time ever between even 1,000 point increments. Of course the higher the Dow goes the smaller those increments become in terms of percentage moves. So far, in 2018 the Dow has gained 1,083 points but only crossed one 1,000 point increment at 25,000. 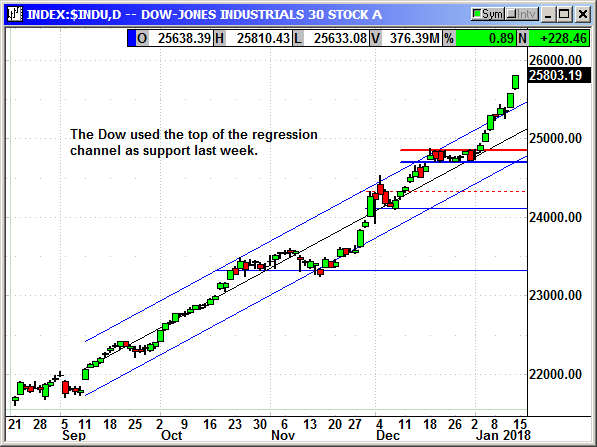 That consolidation pattern in December saw the Dow fail at resistance at 24,850 for two weeks. 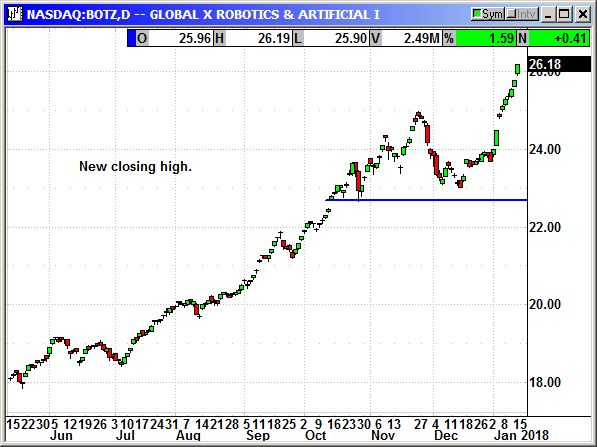 It will be interesting to see if a similar resistance level appears just below 26,000. The Nasdaq has beenresting about every 2-3 weeks for the last six months. 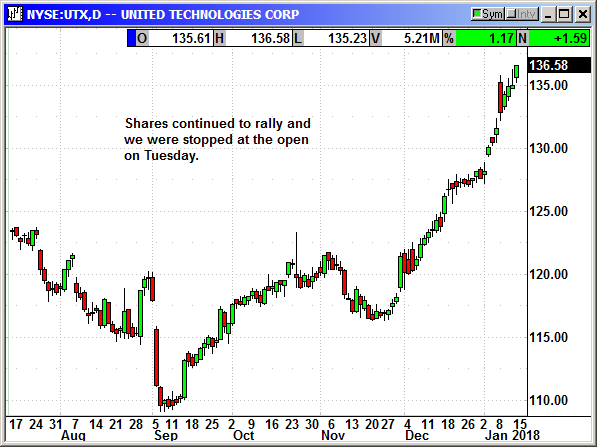 The current rally is two weeks old and is already well overextended. The tech stocks should be due for a rest but they may wait until the big caps report two weeks from now. 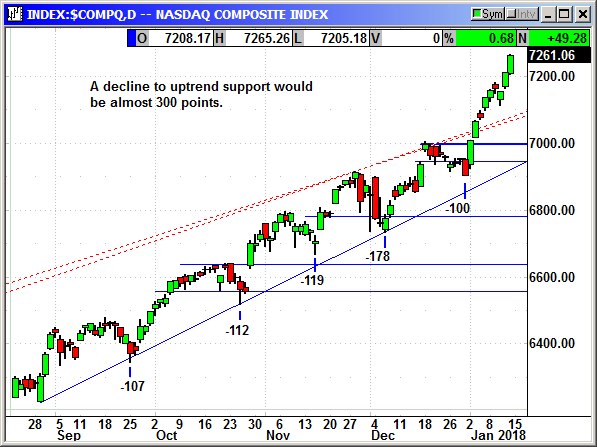 Support on the Nasdaq should be around 7,120 followed by 7,000. 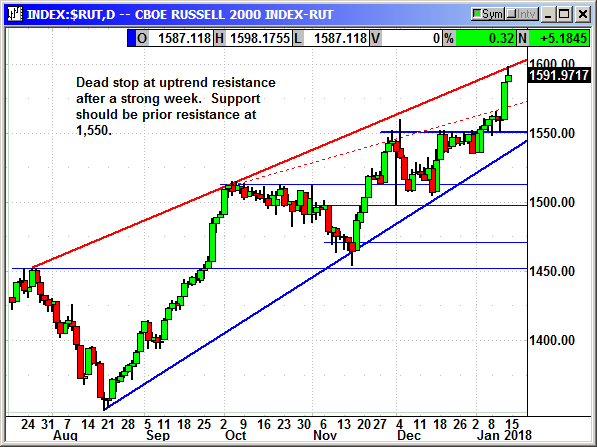 The Russell came to a dead stop at uptrend resistance just below 1,600. The only material gain since the middle of December was a 1.73% spike on Thursday. The rest of the days have been low single digit moves. I do not know what prompted the big gain but I doubt we will just power through 1,600 without a pause. This was a very difficult week to pick stocks. The charts for all the good stocks are vertical to new highs and everybody else is flat to down. I went through more than 800 charts, some more than once and nearly every stock I could justify recommending had earnings over the next 2-3 weeks and the rest were busting out new highs with option premiums also at new highs. If this rally continues this week, we may have to hold off on new entries until we do get a market pullback or we find some stocks that were pounded on earnings. I refuse to recommend entries on stocks with blowout charts. 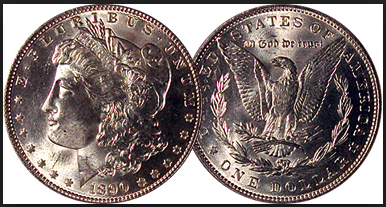 The object of the game is to make money, not to trade just because the market is open and it is a newsletter day. THE EOY SALE ENDS TODAY!! SUBSCRIBE TO THE 2018 SPECIAL NOW! Buy March $120 call, currently $4.60, initial stop loss $109.85. Sell short March $130 call, currently $1.49, initial stop loss $109.85. Net debit $3.11, maximum gain $6.89. The long put position was stopped at the open on Tuesday. No specific news. Monster rebound with the market and the chip sector. No specific news. 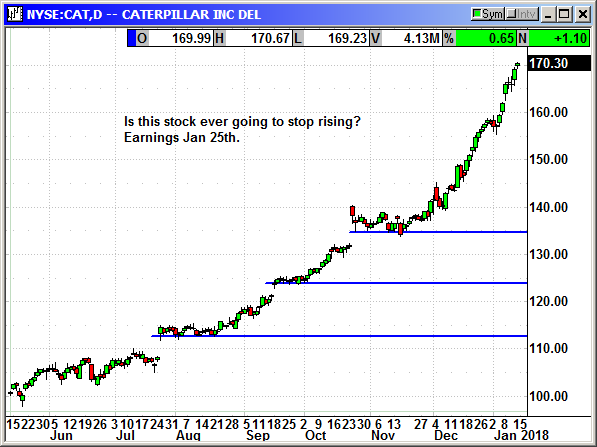 Earnings are Jan 25th and we will exit on the 23rd if not stopped out sooner. 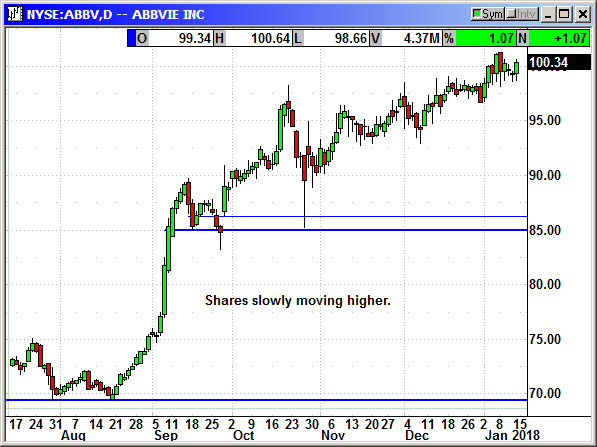 This stock is very overextended and I raised the stop loss again. No specific news. Shares faded off their intraday high on Friday after news broke that activist investor DE Shaw was building a position in Lowe's. Possibly some HD investors took profits and moved to LOW in hopes of catching a spike. I am keeping the stop loss tight because we have a small profit cushion with HD. Wow! Perfect entry. 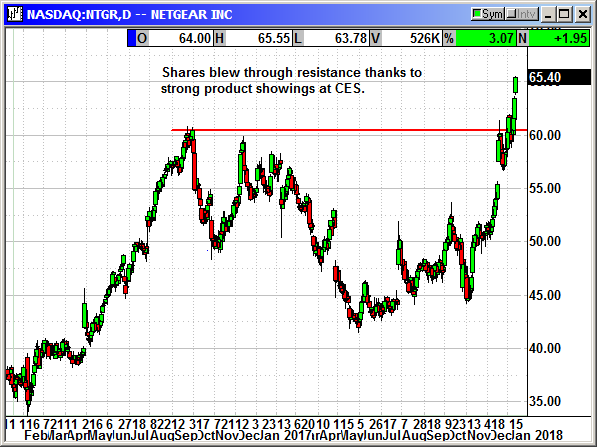 Netgear demonstrated new products at the CES show and the crowd loved them. Apparently, so did investors. They announced the Nighthawk Pro Gaming system of network gear that will cut lag time and enhance multiplayer game play for serious gamers. They also demonstrated the Orbi Wi-Fi system, which has also been very successful. With the rapid ramp of the Arlo video cameras for security, they have completed an entire cloud support system that allows storage of video, multiviewer capability for home monitoring, etc. 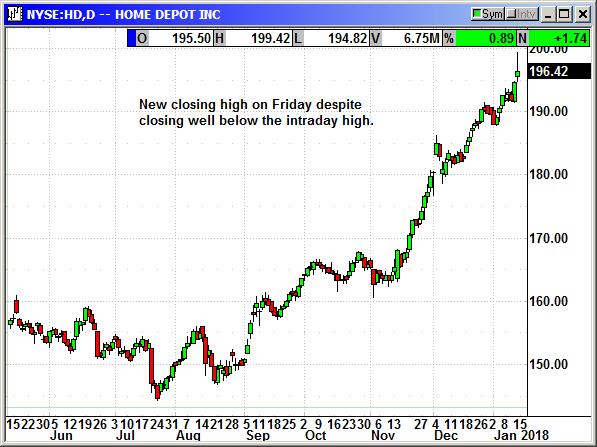 We entered the position on a gap down open at $60.45 on Tuesday and shares rallied to close at $65.40 on Friday. There is no future in shorting any Dow component in this market. 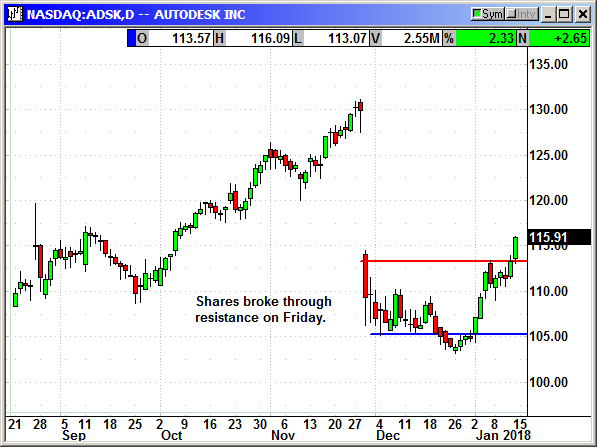 The expected January decline never appeared and we were stopped out of this position at the open on Tuesday. Closed 1/9/18: Long Feb $125 put @ $1.90, exit .75, -1.15 loss.